Udaipur: Geetanjali Medical College & Hospital’s Urologist Dr. Vishwas Baheti have performed a successful Urethroplasty, an open surgical reconstruction or replacement of the urethra that has been narrowed by scar tissue recently. The surgery was done on a 45 years old female, Kamla Devi hailing from Udaipur district and suffering from narrowed section of the urethra. To broaden the urethra, Dr. Baheti had first used a graft (measuring 3 x 1.5 centimeters) below the tongue, known as Lingual Graft. Grafts are used to increase the size of the narrow urethra by patching it, rather than a total replacement. The surgery lasted around 3 hours. 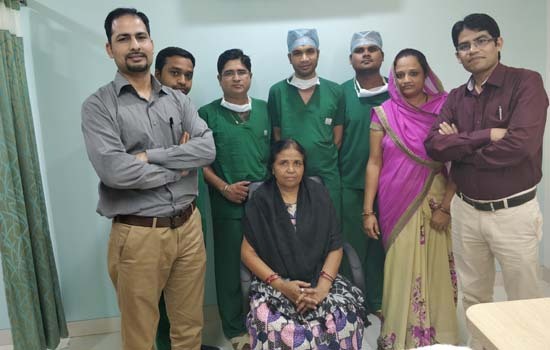 The team of surgeons including Dr. Baheti, also includes Urologist Dr. Pankaj Trivedi, Anesthetist Dr. Uday Pratap, OT Staff Avinash Ameta, Pushkar Saini, Jayprakash Salvi & Praveen Ahari. It has been claimed as the first successful urehtroplasty in female in Southern Rajasthan. “The surgery was really complicated as it requires expertise and skills to perform it successfully. Mostly, the Urologists use Typical grafts to reconstruct the urethra which are harvested from the extra-genital skin or from the inner lining of the mouth. The mouth graft is known as a “buccal graft”. But in this case a sliver of tissue was easily removed below the tongue with no consequences. This graft is known as “Lingual Graft”. Pain is minor & the mouth heals very quickly usually in less than 1 week,” said Dr. Baheti, the Urologist, GMCH. “After the surgery, Uroflowmetry test was conducted for the patient to check for Urinary Retention, Erectile Dysfunction, Bleeding & Urinary Urgency, but the results were normal, thereby making the patient completely fit and fine,” quoted Dr. Baheti. Patient Kamla Devi, age 45 years, was suffering from problems in passing the urine from last 10 years. On consultation at a nearby hospital in Gujarat, she had undergone a Laproscopic Procedure for the broadening of the urethra. Due to which she had to visit the hospital every month. But since 2 years the problem became more complicated thereby making no relief from laproscopy. On visit to Geetanjali Hospital, & consultation with Dr. Baheti, this surgery was performed. The patient recovered well and is living a normal life.